Audie L. Murphy, Texas. Major, Infantry, World War II. June 20, 1924 to May 28, 1971. Medal of Honor, DSC, SS & OLC, LM, BSM & OLC, PH & 2 OLC. ^ Obituary Variety, June 2, 1971, p. 55. ^ a b c d Taffin, John (2003). “Don't You Ever Forget Audie Murphy”. Guns Magazine 40 (2). ^ Murphy, Audie (1949). To Hell and Back. New York: Henry Holt and Co.. OCLC 2037656. ^ Stephen L. Henley, Sr., J.D. ^ Beaver County Times – Oct 16, 1970. ^ $2.5 Million Awarded to Family of Audie Murphy Los Angeles Times (1923-Current File) [Los Angeles, Calif] 13 Dec 1975: 12. Gossett, Sue. 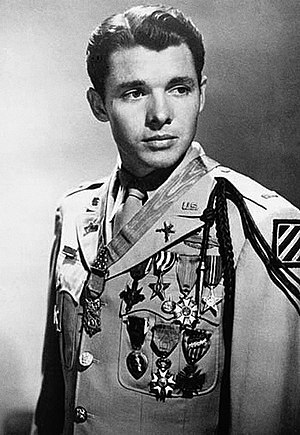 The Films and Career of Audie Murphy, N.C., Empire Publishing, 1996. Graham, Don. No Name on the Bullet, N.Y.: Viking, 1989. Murphy, Audie. 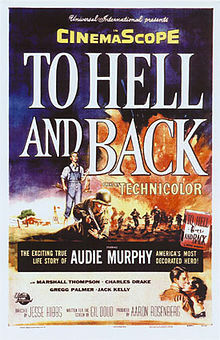 To Hell and Back, N.Y.: Holt, 1949. Editors, Super GI, Life Magazine-World War II-Special Issue,Vol 8, number 6, Spring-Summer 1985, 28.